This book investigates the effects of brain lesions in the left hemisphere, specifically Broca’s area, on the production and perception of vowels, of word tones and of the linguistic use of sentence melody. We aimed to test how and to what extent Beijing aphasic patients process Chinese word tones and sentence melody (question versus statement intonation) relative to healthy Beijing speakers and relative to learners of Beijing dialect with (Nantong, Changsha) and without (Uygur) a tone language as their native tongue. – given that both segments and word tones are lexical properties – or to the sentence melody – on the strength of the argument that word tones and sentence melody share a tonal representation. 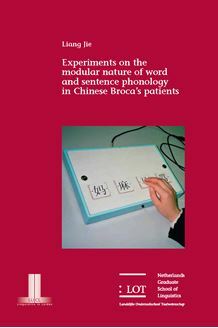 A subsidiary question is to what extent the mental representation of the word tones in a tone language (such as Beijing, a dialect which is very close to standard Mandarin) in the brain of Broca’s aphasic patients is comparable to that of speakers of Beijing dialect as a second language. The results indicate that word tones are represented separately from the segmental structure and from sentence melody. Moreover, the mental representation of the tones in the patients is defective in a way that resembles the deficit of a second-language speaker. This study is of interest to neurolinguists, phonologists and phoneticians.